Huskies are now without two of their three leaders. Down, but not out. The Huskies came back Saturday night against the Wisconsin Badgers and ended up with a 3-3 tie and 3 out of 4 points on the weekend. The Huskies were up 3-1 until about the last 5 minutes of the third period. Unfortunately, penalties (which were fairly inconsistent all night) cost the Huskies the weekend sweep. The major story of the weekend though was senior captain Drew LeBlanc breaking his leg in two places after a bad fall into the boards. Now, with both Mike Lee and Drew LeBlanc out with injuries, two of the Huskies leaders and best players are out for what looks like at least until sometime in January, if not later. The Huskies are definitely in a tight spot, but the deep talent and the strong freshmen performances by goalie Ryan Faragher and defensemen Jarrod Rabey and Andrew Prochno should help. This weekend the Huskies will head to Mankato to face the Mankato State University Mavericks. 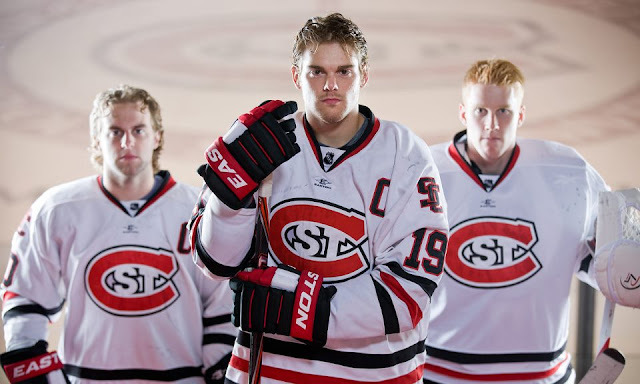 The Mavericks vs. SCSU series has always been one I enjoy and will be one of the opponents I will miss when the great shift in conferences happen in a couple of years. The Mavericks have not been great yet this year, but they have had a lot of early injuries. Last weekend they were able to beat a very hot Michigan Teah team. It should be a good series; however, I am hoping and expecting a Husky sweep.